Viacom and CBS stocks’ share prices are both trading up as of noon ET on Thursday, closing out a morning in which parent company National Amusements, Inc. officially called for the two publicly traded corporations to explore a merger. 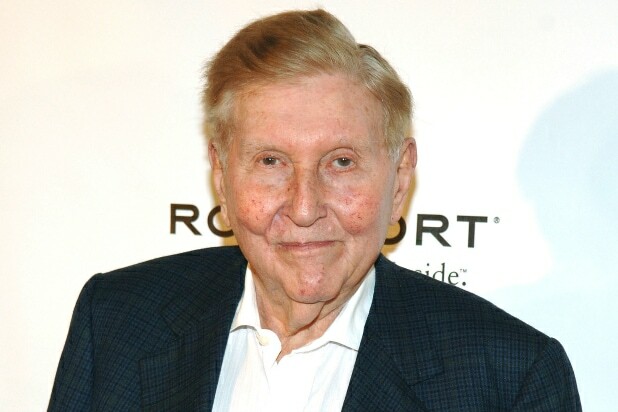 Sumner and Shari Redstone want Viacom and CBS to rewind to pre-2005 — when they spun off from one another — via an all-stock transaction. Yesterday, we knew this mandate was coming in some form — today, it took shape via a formal letter to the boards of both media companies. In the strongly worded formal request, the Redstones said they are not interested in a third party taking over either company. 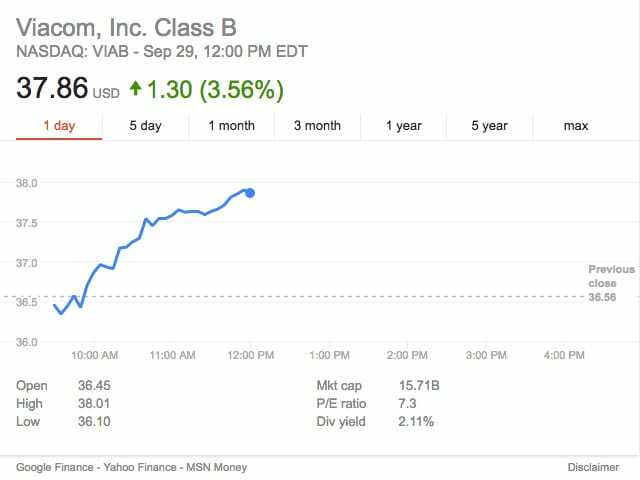 VIAB is up a rounded 4 percent after the morning session, or $1.30 per share. 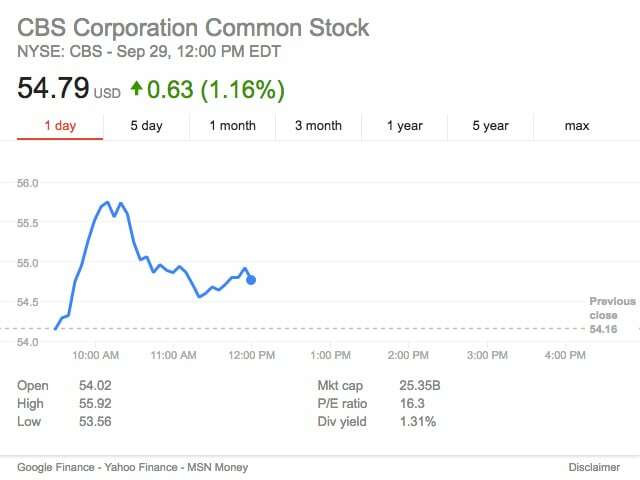 The pricier CBS is trading up just 1 percent, which translates to 63 cents apiece. 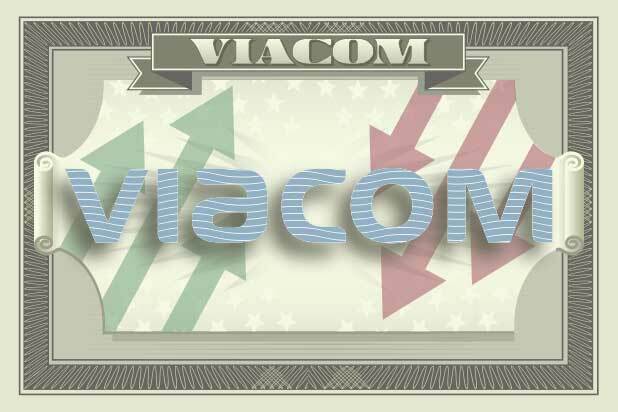 Also Read: Does Tom Dooley's Departure Open the Door for a Viacom-CBS Merger? Les Moonves leads CBS, which is doing much better than Viacom. Not only has Viacom’s stock been struggling since last fall with weak results for its cable networks and Paramount movie studio, this entire calendar year has featured court battles and media bickering between ex-Viacom boss Philippe Dauman and the Redstones. Ultimately, the latter won, and Sumner’s former protege Dauman accepted a settlement to depart Viacom. He left the company in lifer Tom Dooley’s hands — unfortunately, that guy quit after about a month, re-igniting talks of the possible re-merger. Should it happen the way the Redstones hope, Moonves is likely to emerge as head honcho of the whole thing.